Exactly why is the news industry staggering through the digital revolution? How is its action (or non-action) affecting our communities? What should be done to help people get the information they need? Those are just a few of the questions a raft of recent reports tried to answer. 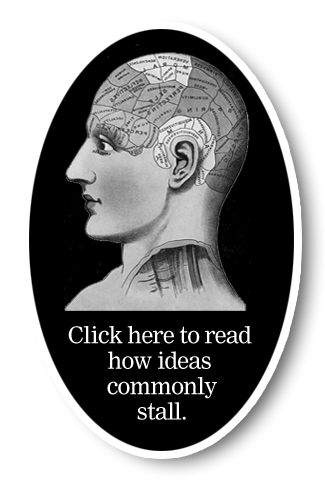 The studies come from centers, universities, journalists, foundations and think tanks. On some points — innovation, transparency and collaboration — they agree. The latest (and best) of the reports came from the Tow Center for Digital Journalism, established in early 2010 at Columbia University to lead journalism into the future while serving as a research center in the present. The center is directed by Emily Bell, formerly the guru of digital content for the Guardian news group in Britain, in hope of a bridge between digital technology and journalism standards credibility. In “Post-Industrial Journalism,” we see that legacy news institutions still have a special worth. They are more than watchdogs that expose wrongdoing. They are big and powerful scarecrows whose very presence prevents wrongdoing. That said, the report argues that traditional media are losing power because even as they are losing revenue and market share, they fail to take advantage of new digital-friendly working methods and processes that could make their work cheaper, easier and more engaging. The authors list some of the ways that newsrooms can get back on top: Don’t send your own reporter to a crowded press conference, but form partnerships and share content; embrace transparency, show your work to engage readers; use open-source tools and platforms made by others; let talented people experiment with storytelling, and find something you are good at and focus your energies there. 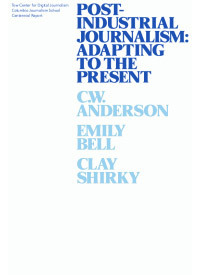 This report, by the professional-academic partnership of former Washington Post executive editor, Leonard Downie, Jr. and noted scholar Michael Schudson, focuses on where the money for good journalism can be found and offers several recommendations to turn the current moment of disruption into a reconstruction of American journalism. 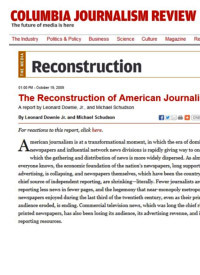 The authors talk about “reconstruction” because while the Internet has made the American media landscape more diverse than ever, it has also destroyed the traditional, ad-funded market that supported traditional journalism. The loss of reporting jobs has created gaps in local coverage and weakened the watchdog role of the fourth estate. 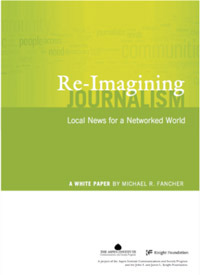 To replace ad revenue and strengthen the public’s access to information, the authors propose that the government authorize any news organization to become a non-profit; foundations support journalism projects; public radio/television and universities cover local news; a fund for local news be created with money from telecom taxes, and access to public information be increased. 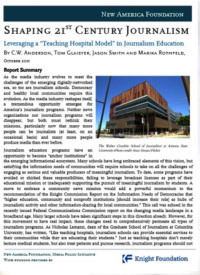 This report focuses on leveraging the “teaching hospital” model in journalism education, It was written by a team from the New America Foundation, notably including Tom Glaisyer, a media scholar who went on to do program work at the Omidyar Network. As a long-time advocate of the teaching hospital model, I was a source for this one and glad to see these independent reporters embrace the idea so enthusiastically. The authors argue that journalism schools may be threatened with obsolescence unless they rethink their practices. But if they do reinvent themselves, they could soar to become “anchor institutions” in our emerging informational ecosystem. One way to achieve that is to provide engaging journalism to communities through laboratories of innovation. But this change will require leadership and risk-taking. This report proposes that journalism programs partner with other programs at their universities and with their local media and experiment with technology. A major series in the Economist covered social media, how media is faring in different countries, WikiLeaks and other media “newcomers.” Discussing impartiality, the magazine describes Fox News as “offer[ing] distinctively right-wing opinion and commentary,” and says that “MSNBC… has lately been positioning itself to appeal to a left-wing crowd.” From the other side of the Atlantic, the British seem to see our cable news slants more clearly than we do. A pie chart in the report shows that American newspapers depend on advertising for 85 percent of their revenues — more than any other country. This is the very model now collapsing as ads become free or low-cost on the Internet. It reminded me of a seminar when the now-departed USA TODAY founder Al Neuharth asked circulation department leaders why they couldn’t bear more of the burden of bringing in newspaper revenue. They looked at him like he was nuts. But he was right. The newspaper industry got too hooked on advertising during the time when American daily newspapers were local printed news monopolies, making tons of money on classified ads. 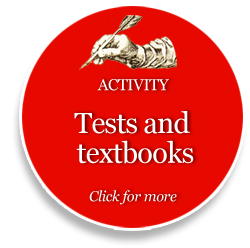 The Economist series pointed out that other industrialized countries developed more hybrid systems, where half the revenue (or even more, in Japan) comes from subscribers paying for the content. Those nations will see easier transitions to the digital age than ours. We were the giants of advertising, and the bigger you are, the harder you fall. 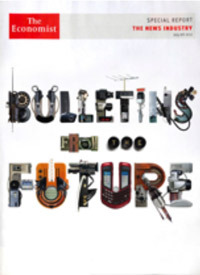 The Economist stories were long on descriptions of problems but short on solutions. The “philanthrojournalism” piece was particularly weak: It suggests that foundations should fully endow nonprofit journalism, which many if not most foundation leaders worry would undermine the connection between the news organizations and the communities they hope to serve. 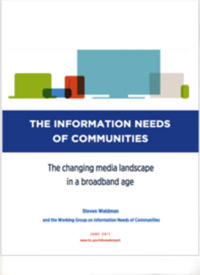 The Federal Communications Commission Report, “Information Needs of Communities,” written by Steven Waldman and the Working Group on Information Needs of Communities, is a massive 478-page tome looking at the health of American media in its different platforms (print, radio, television, and so on) as well as the evolving habits of media consumers. It notes that newspaper staffing levels are down to where they were in the 1970s; that network news staffs are down by half; and that reporters are so busy “on the hamster wheel” trying to produce copy, blogs and tweets that they don’t have time to investigate stories. Its main contribution is in declaring the crisis in “local accountability reporting” i.e., the watchdog news citizens need to run their communities. Its solutions include increased transparency, increased innovation from the Corporation for Public Broadcasting, and changes in tax policy to help nonprofit media organizations become self-sustaining. Other ideas include increased funding from philanthropists and foundations, as well as selling off unused spectrum bandwidth and reinvesting at least a little of that money into the media landscape. As much as I liked the massive report, you can absorb the main idea about the crisis in local accountability reporting in a later work by Waldman, this three-minute video. 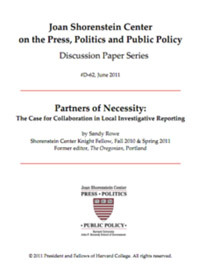 Sandy Rowe’s paper, “Partners of Necessity: The Case for Collaboration in Local Investigative Reporting,” concentrates on local media and determines that collaboration is the key to local accountability journalism. Rowe, a longtime industry leader as the editor (until 2009) of the Portland Oregonian, presents case studies that include partnerships between newspapers and nonprofits, newspapers and journalism schools, and newspapers amongst themselves. The paper is especially valuable when it delves into successful nonprofit reporting experiments in Colorado, Oklahoma and elsewhere. Rowe argues that collaborations are the best way to compensate for lost newsroom resources because they pool people’s skills and expertise. Because all newsrooms operate differently, collaborations also encourage flexibility and adaptability. She rightly argues that journalists need to let go of their devotion to exclusivity and internal secrecy. Her call for collaboration, transparency, public participation and networking is in the same family as former Sacramento Bee editor Melanie Sill’s paper on “Open Journalism,” which created a surge of interest in the phrase. I first wrote about pre-Internet versions of the techniques in the early 1990s in rough form in a workbook called The Open Newspaper. Fancher’s report was a one of a series of white papers produced by the Aspen Institute. Many news organizations won’t survive the digital age, and those that do are likely to have the types of hybrid models involving digitalization, community engagement, collaboration, students and nonprofits. I recommend reading this report back to back with one written by the former editor of The Des Moines Register, Geneva Overholser’s “On Behalf of Journalism: A Manifesto for Change.” The manifesto, written almost a decade ago when she was an endowed chair at the University of Missouri, warns that journalism as we knew it was over. Why has change been so slow? The defensive newspaper culture, said Michele McClellan and Tim Porter in the book News, Improved. Today, we get another chance with mobile. This time, we should be prepared.